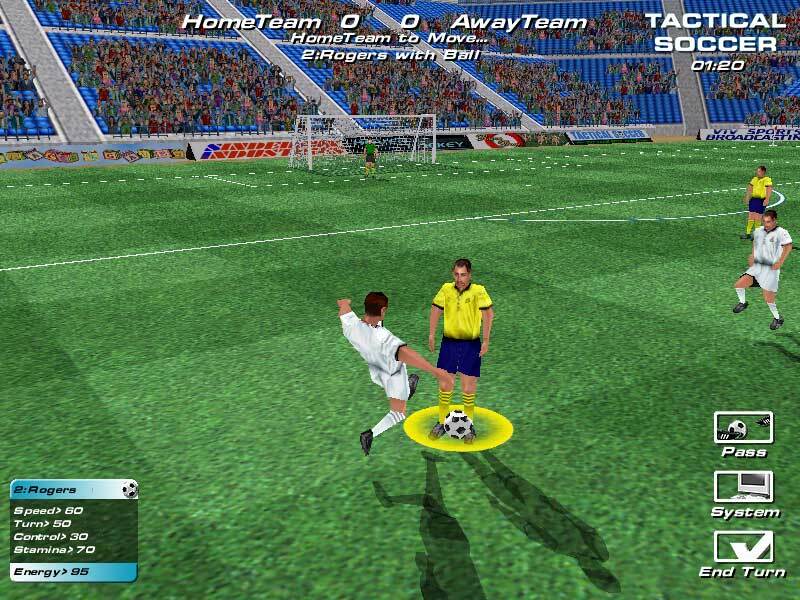 Currently virtually all Soccer games can be classified under two gaming styles: the first person arcade style action game or the Football Manager game. 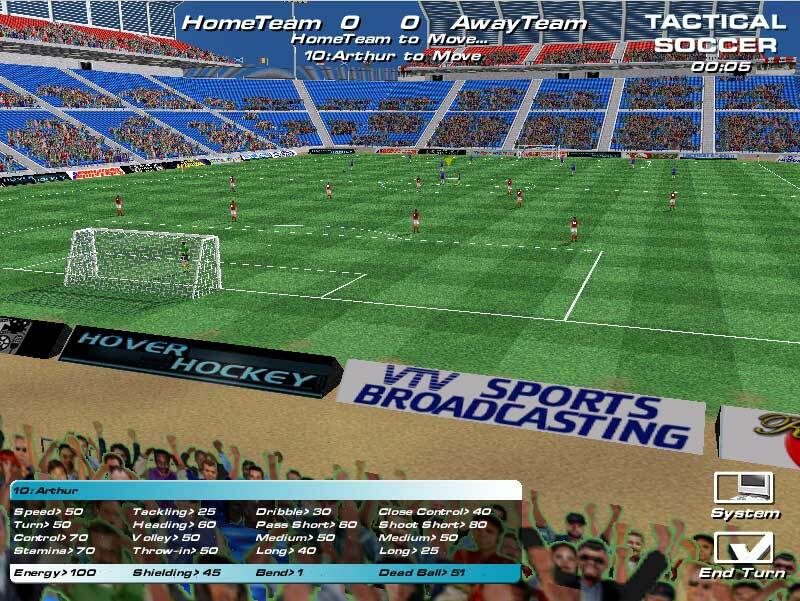 Tactical Soccer gives you a third choice. 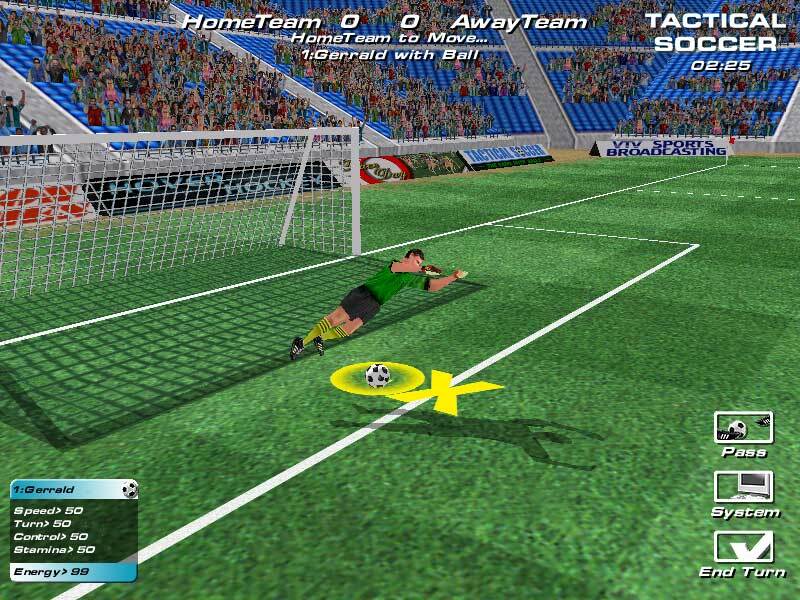 Tactical Soccer is a turn-based simulation of the soccer match. You control all 11 players at the same time. So instead of shouting at your left back to ‘get forward’ you control him and can build up an attack exactly how you want. You are the coach and have real control of the team. Tactical Soccer is the thinking person’s soccer game. Selecting exhibition match will allow you to play head to head against another human player on the same machine or against a computer opponent. You set the game parameters such as whether it’s for one or two human players, rename the teams and level of difficulty (the higher the number the harder the game will be). - Change the name of your team (just click on it and hit enter when finished editing). 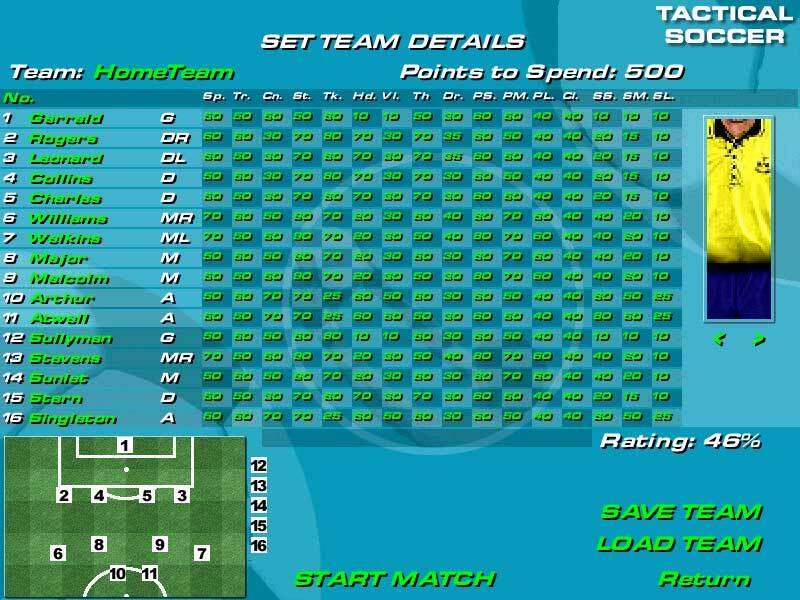 - Spend points to improve your players abilities (Tactical Soccer has lots of stats which represent each soccer player. At the start the coach has a certain amount of money/points to train players to meet their needs – set by the difficulty level). LMB increases the rating, RMB decreases – note some ratings have a minimum level and cannot be set any lower. - Change the player’s name. - Sort them by position by pressing No. - Change the team’s strip. - Alter the player’s position and therefore the team’s formation. Just click on their shirt number on the pitch and then where you want them to move to. - Promote substitutes. Just click on their shirt and then on one of the substitutes (12 to 16) shirts. - Save and load your favourite teams. (Note the team strip is currently not saved). This allows players to create their own teams – which they can save and use to play against their friends. The rating % can be used as a form of handicapping. There are some other attributes which you cannot directly set but are calculated by Tactical Soccer. This really puts you, the coach, in control. You decide who plays in what position and these skill ratings will set how they play. Note: At kick-off the player with the ball will automatically pass the ball to the team-mate next to them when you hit end turn. This is known as Automatic Kick-off. Coach 1: Selects players with the LMB (left mouse button) and clicks to the spot where they should run to on the pitch. RMB cancels the move. They can also get players to turn around and also to be prepared to jump to head or volley the ball. If the player has the ball they can select where they want to pass the ball to. In addition they can set the height of the pass and the bend. The coach then hits end turn, and the ball gets passed and his players move. Note: the opposing goalie will automatically react to shots on goal and players will automatically try and head the ball if it arrives to them in the air. Coach 2: Now takes over and gives the orders to his players. Coach 2 then hits end turn, and the ball gets passed and his players move. Note: once again the opposing goalie will automatically react to shots on goal and players will automatically try and head the ball if it arrives to them in the air. The game continues between the two coaches until time is up. The teams will switch at half time. The game is really as simple as that to play. However you get a great deal of variety due to the skill mix of teams and their formations. To help new coach’s get into the game an alternative control mechanism is available (you can toggle between the two using the S key). 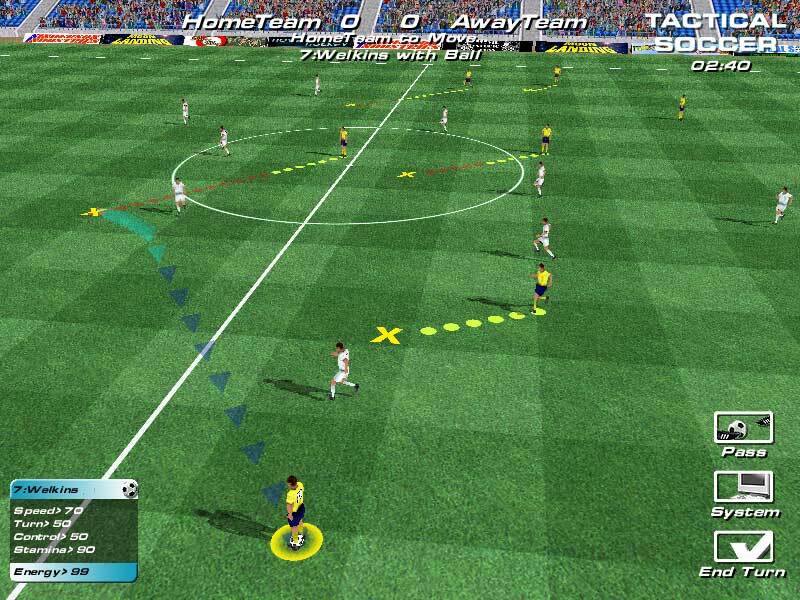 The difference is that whenever the coach gives a command to a player (where the player should move or pass to) the control moves to the next player nearest to the ball in their team and the camera moves to look at the player with the ball in the distance. If you do not want to give an order to a player then use the RMB but click on a space on the pitch clear of players. This handholding mode therefore takes the coach around all of their team members. When the coach has finished giving orders they can select end turn – just as normal. By default this mode is on. What happens when you click on the pitch depends on what player is selected and whether they have the ball or not. Select: LMB on the feet of the unselected player: selects the player (circle appears around them). To help you select a player the mouse pointer changes to a hand when you are over a player. Move: LMB on pitch sets the move-to point (yellow X marker and tracer dots appear. Yellow tracer dots indicate the player should reach these points this turn, red dots indicate they will not get there this turn). Heading: Hold LMB down on selected player and the jump arrow appears, move the mouse around (while still holding the LMB down) to set where the header will go. Release the LMB to set the heading. Alter Direction that they are Facing: Hold RMB down on selected player and the turn arrow appears, move the mouse around (while still holding the RMB down) to set which way the player should face. Release the RMB to set the direction that they should turn and face. Cancel Selected Player’s Instructions: RMB on pitch cancels move or jump in expert mode. Dribble: LMB on pitch sets the move to point (yellow X marker and tracer dots appear). Pass: LMB on selected player switches you to pass mode (there is an icon on the side that has the same affect). Now when you move the mouse the pass-to point (red X marker and tracer dots) moves. When you reach where you want the ball to end up, press and hold the LMB. While holding the LMB, moving the mouse sets the height and bend of the pass (vertical mouse motion sets the height while horizontal motion the bend). Releasing the LMB sets the pass up. The colours of the tracer dots indicate whether this pass is considered, short, medium or long. You can also shoot on goal – if you click the mouse in the goal the pass tracer pattern will be slightly different and the player will kick the ball harder. Cancel: RMB on pitch cancels move or pass/shot. Note: the player has the choice of either passing or moving each turn – they cannot do both. Moving the mouse to the edge of the screen will start it to scroll. Toggles Beginner mode – End Turn only becomes active after player 11 has been selected. Change the amount of data on the Info panel that appears on the bottom left of the screen. Besides End Turn and Pass, System also appears. System allows you to save the game, restart the game, exit to Windows and also access a further options screen that allows you to set the audio and configure how the game plays. Players can move all of their team each turn. To tackle someone just move your player into the player with the ball. Players that are tackled are ‘stunned’ for one turn and cannot move. 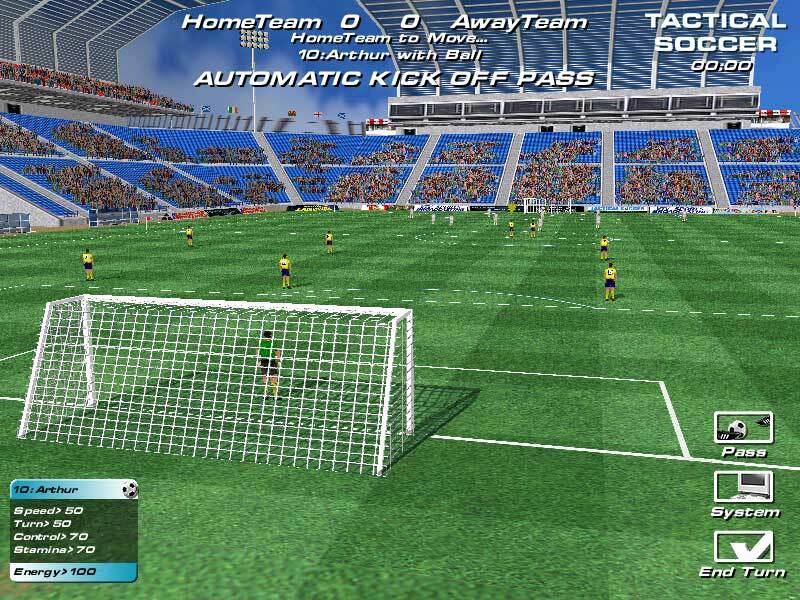 Kick-off takes place automatically when you hit the first end turn, with the ball being passed to the nearest attacker. This means that at the start you cannot give move orders to the two strikers involved in the kick-off. 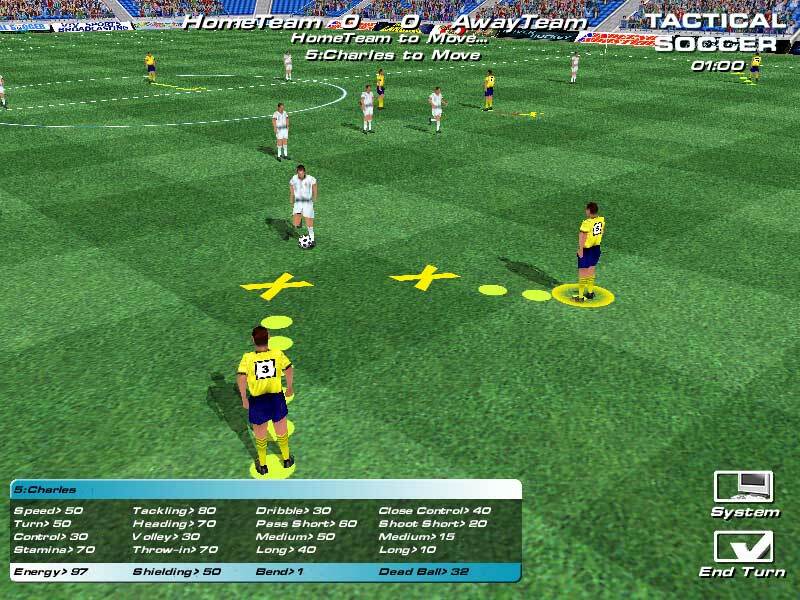 This allows Tactical Soccer to simulate match tiredness. Players will have to be (subject to their stamina rating) used sparingly and will not be able to run around all the time. When their energy drops below their stamina their speed slows. Is implemented – so don’t goal hang. When the ball goes out of play the subs icon appears. Click it to access a panel. Scroll through the subs available until you find the one you want to come on. Are implemented – as well as penalties. Text messages will appear if a player gets injured as a result of a bad tackle. It will be up to you to substitute them. Until then their performance will suffer. Knockout cup and league play variants are available in the full version. You need Windows 98 or 2000 or XP. Plus if you haven’t got XP you’ll need at least DirectX 8 (which is available from Microsoft as a free download). As for machine spec: you need at least 8 Mb of video RAM (the more the better), a 400 MHz processor or higher, DirectX compatible soundcard and mouse. To be honest we find it impossible to predict whether it will run on any specific machine so why not just download the free demo version and see. You can only play a single exhibition match which will last three minutes of game time (about 36 turns). Thanks for your time and we hope you enjoy PlaceForGames: Tactical Soccer.